Proceeding is online. The CEUR-WS Proceeding is now availabe here. 30 Submissions received. We are happy that we received in total 30 submissions from you, the EMISA community. 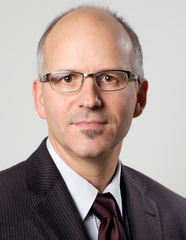 Moreover, we are very pleased to announce Mathias Weske and Janis Stirna as the keynote speakers at EMISA 2018. For a short introduction to the keynote topics, see below. We will hand over a receipt to each participant at the registration desk during EMISA 2018. Please understand that without a payment visible on our banking account or at least a credible document supporting your argument that payment has been made, on-site registration is required. Thank you very much for your kind cooperation. By Plane: There is a small airport (RLG) near Rostock, but most flights are rather expensive. However, there are some affordable connections, e.g. to Stuttgart. So try your luck on any major flight search engine such as Skyscanner. It is however probably much easier and cheaper to fly to Hamburg (HAM) or Berlin airports (SXF, TXL) and take a train to Rostock. Have a look at www.bahn.de and search for a connection to Rostock. You can also hire a rental car at the airport. 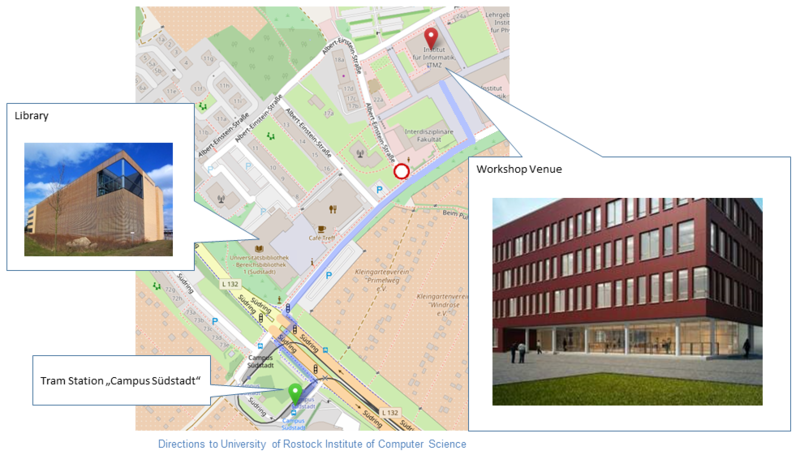 The meeting will be held on 24th and 25th of May 2018 in the building of the Institute of Computer Science in Albert Einstein-Straße 22, 18059 Rostock. You can reach us by Bus (line 28) or Tram (line 4 and 6) getting off at station Campus Südstadt. Tram line 6 is the best choice if you arrive in Rostock by train (central station). Bus and tram schedules to station Campus Südstadt and fares can be found at www.rsag-online.com. When getting off at station Campus Südstadt, you just have to follow down Albert-Einstein-Straße passing by the University Library and main student canteen. If you see the large paved area, turn left and go straight on where you will already see the Institute of Computer Science – a dark red square shaped building. To order a Taxi in Rostock call +49 381 685-858 (Taxigenossenschaft Rostock eG). If you want to reach us by Car, our parking directly at the institute is free for you. However, you will need to consider a construction site due to which the parking is only accessible from one side of the Albert-Einstein-Straße. Please use this route to get to our parking. To gain access at the parking barrier, please press the call button and say that you are attending the EMISA conference. We will meet for dinner in the Braugasthaus zum alten Fritz. Address: Warnowufer 65, 18057 Rostock. 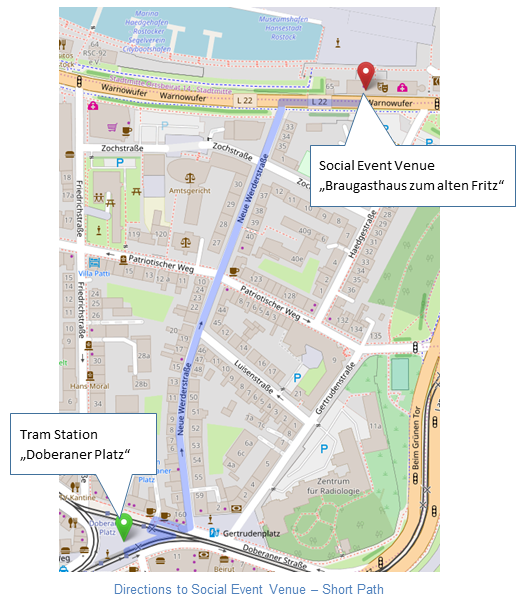 To directly reach the social event venue, take the tram line 6 from Campus Südstadt and get off at Doberaner Platz (see Map below). From there you walk about 10 minutes. You just have to follow down Neue Werderstraße and then turn right at the harbor to find the social event venue Braugasthaus zum alten Fritz. If you are interested in a little walk through the beautiful pedestrian zone of the city, you can take the tram line 4 or 6 from Campus Südstadt and get off at Neuer Markt (see Map below). The city hall is directly located at this tram station. At the northernmost entrance columns of the town hall porch you will find a bronze snake. It should bring good luck to stroke the snake’s head. Nearby you can also find St. Marien Church, where you can admire an astronomical clock built in 1472. Walking through the pedestrian zone you will see the impressive University’s main building. The University of Rostock is one of the ten oldest universities in Germany. The landmarked main building of the University of Rostock is a representative of the Mecklenburg neo-renaissance and was built in 1867. The four founding faculties medicine, theology, jurisprudence and philosophy are depicted as emblematic figures on four pillars on the front facade. To the left side of the building you will find a nice cloister garden. This is just a small selection of interesting things to see in the city. Walking through the pedestrian zone you will discover further wonderful places. 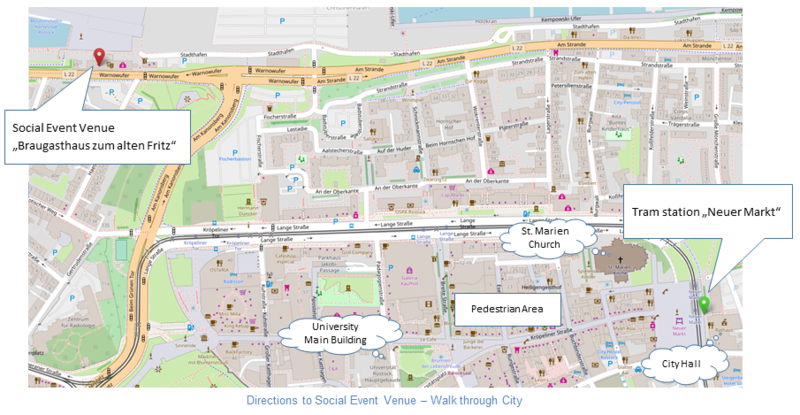 In order to reach the social event venue from the city just turn right and walk towards the harbor. Then turn left and follow the big street near the water to find the social event venue Braugasthaus zum alten Fritz. 2,2 km walking distance. Stylish atmosphere and appearance of the rooms. 1,6 km walking distance. Rather simple rooms, but the closest hotel to the conference venue. 2,2 km walking distance. Directly located near the train station. Tram ticket included in the room rate. Located directly in the beautiful inner city area and the pedestrian zone, many restaurants near the hotel. Simple rooms, but good breakfast. Charming "Jugendstil"-villa, highly rated on major booking platforms. 4**** star hotel yet affordable, but a bit in the suburbs. The Programme is downloadable as PDF-file here. Recently, the scope of research in business process management has widened considerably. In this talk, two key areas will be investigated, case management and decision management. While case management has been discussed for a while, it has not yet found its way into practice, the lack of an established syntax and of a concise semantics being among the reasons. This talk sketches a novel approach to case management, which is based on dynamically combining process fragments as required by knowledge workers. The conceptual results are prototypically implemented in the Chimera platform. Decision management is a recent research area with massive interest by the financial industry in its quest to support compliance and auditing requirements. While the principles of combining process and decision models are well understood and even standardized, a number of conceptual issues remain open. We have investigated the classic soundness property of processes in presence of decision models . With decision soundness, a novel correctness criterion is introduced, which takes into account decision logic when analysing behavioural properties of business processes. The talk concludes with thoughts on research in business process management and the role of the BPM conference. Enterprise Modeling (EM) has become a widespread activity in enterprises. Strategy development, business process mapping, requirements engineering, product development, enterprise architecture management, information system design are just a few examples of organizational activities that benefit from a model-based way of working and knowledge representation in the form of models. EM helps addressing organizational development from a number of perspectives, such, strategy (goals, challenges, opportunities, capabilities), business operations (processes, actors, resources), information (business concepts, products), information technology (requirements, components), etc. However, to develop efficient solutions and to ensure their fit in the organization all of these perspectives need to be analyzed in an integrated way. Furthermore, EM activities often require involving groups of people, i.e. the models are created in a participatory way. To be efficient, such participatory EM sessions need the support of dedicated persons who know how to organize a modeling project and modeling sessions, how to manage discussions during a modeling session, and what aspects influence the success and efficiency of modeling in practice. This talk will address a number of lessons learned from managing modeling projects and facilitating participatory EM sessions. More specifically, we will focus on the critical success aspects of the EM process, stereotypes of actor behavior in modeling sessions and modeling projects, as well as, patterns and anti-patterns of EM project management. The strategic importance of enterprise modelling has been recognized by an increasing number of companies and public agencies. Enterprise modelling delivers the ‘blueprints’ for co-designing and aligning business and enterprise information systems such that they complement each other in an optimal way. As example consider the support of business processes by process-aware information systems. Achieving such interplay requires a multi-perspective approach taking organizational, economic, and technical aspects into account. In a world of cloud, social and big data, additional challenges for enterprise modelling and the design of information systems architectures are introduced, e.g., in respect to the design of data-driven processes or processes enabling cross-enterprise collaboration. 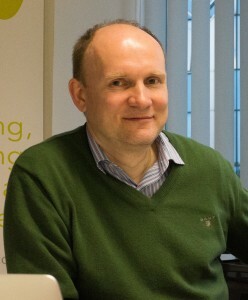 To deal with these challenges, a close cooperation of researchers from different disciplines such as information systems, business informatics, and computer science will be required. The workshop is organized by the GI Special Interest Group on Design Methods for Information Systems (GI-SIG EMISA www.emisa.org), which provides a forum for researchers from various disciplines who develop and apply methods to support the analysis and design of information systems..
EMISA 2018 invites PhD students to submit research proposals. There will be a dedicated slot in the program to discuss PhD research proposals including the current status and the further plan of the research work. PhD research proposals shall be submitted as a short paper of 5 pages. EMISA 2018 invites proposals for scientific talks of international excellence. Eligible are proposal submissions that are based on published or accepted papers from international conferences or journals. Proposals for research talks shall be submitted as an extended abstract of up to 2 pages. EMISA 2018 invites proposals for talks that motivate a novel research direction, outline the research gaps to address, and carve out major challenges. These talks shall serve as a stimulus for discussions as part of a dedicated slot in the workshop program. Novel directions talk proposals shall be submitted as a short paper of 5 pages. All accepted submissions (PhD Research, Current Research Talk, Novel Directions Talk) will be published in the next print edition of EMISA Forum. The short papers proposing PhD Research or a Novel Directions Talk will also be published as an electronic CEUR proceedings volume. All submissions have to strictly follow the formatting guidelines of LNI. Template and explanations can be found at the GI website. Submissions have to be made via easychair.org.